Download "Use the following to answer question 9: Exhibit: Keynesian Cross"
b) What happens to the level of output and the price level in the short run and in the long run? 5. The dynamic aggregate demand curve is drawn for a given: A) money supply. B) real interest rate. 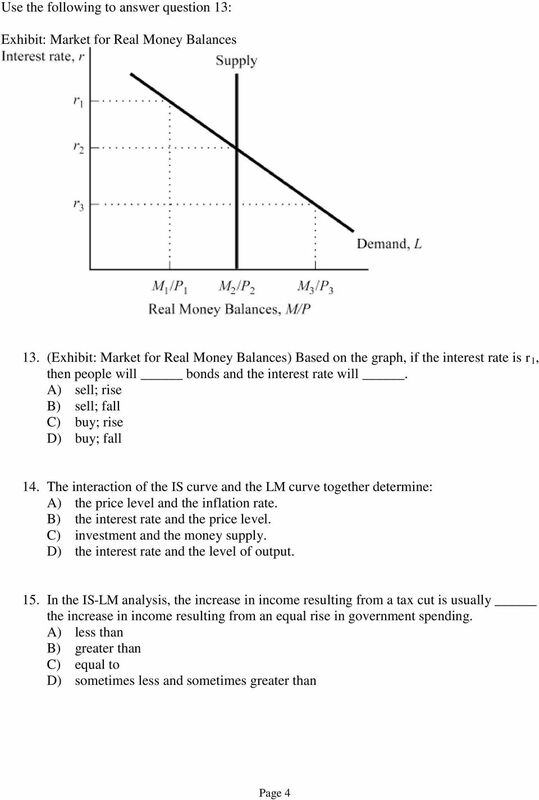 C) monetary policy rule. D) inflation rate. 2. a. The IS curve is found from the equation Y = Cd + P + G = (Y - 100) - 500r r+ 100, or 0.5Y = r, or Y = r.
1. a. Interest-bearing checking accounts make holding money more attractive. This increases the demand for money. Economics of Money, Banking, and Fin. 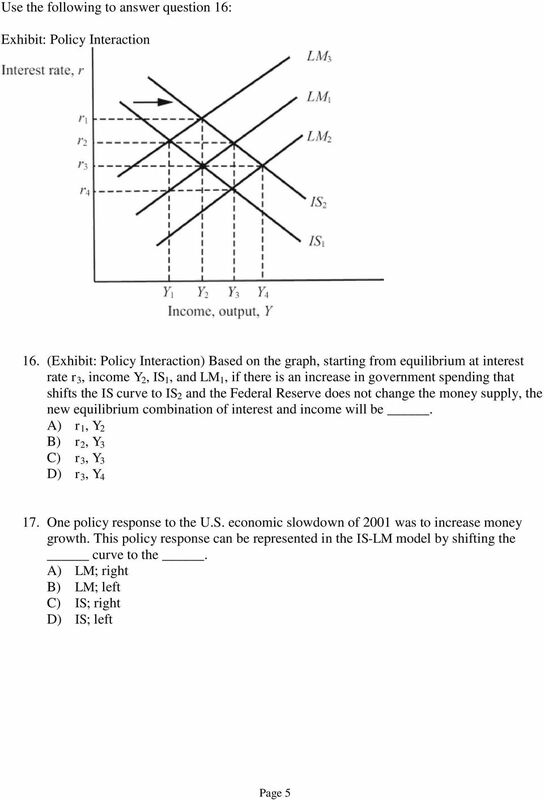 Markets, 10e (Mishkin) Chapter 22 Aggregate Demand and Supply Analysis. 22. MULTIPLE CHOICE. Choose the one alternative that best completes the statement or answers the question. 35 questions, each 1. 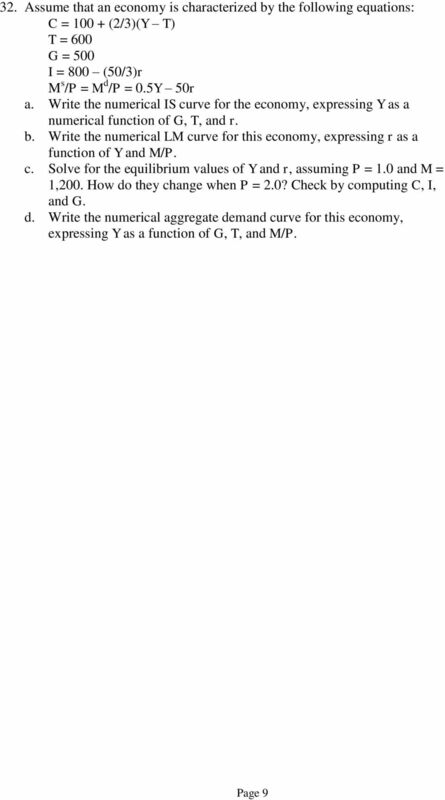 Principles of Macroeconomics Prof. Yamin Ahmad ECON 202 Fall 2004 Sample Final Exam Name Id # Part B Instructions: Please answer in the space provided and circle your answer on the question paper as well. I. MULTIPLE CHOICES. Choose the one alternative that best completes the statement to answer the question. MULTIPLE CHOICE. Choose the one alternative that best completes the statement or answers the question. Problem Set 4. We are asked to label each of the seven statements as true, false or uncertain and to justify our answers briefly. ECON 3312 Macroeconomics Exam 3 Fall 2014. Name MULTIPLE CHOICE. Choose the one alternative that best completes the statement or answers the question. 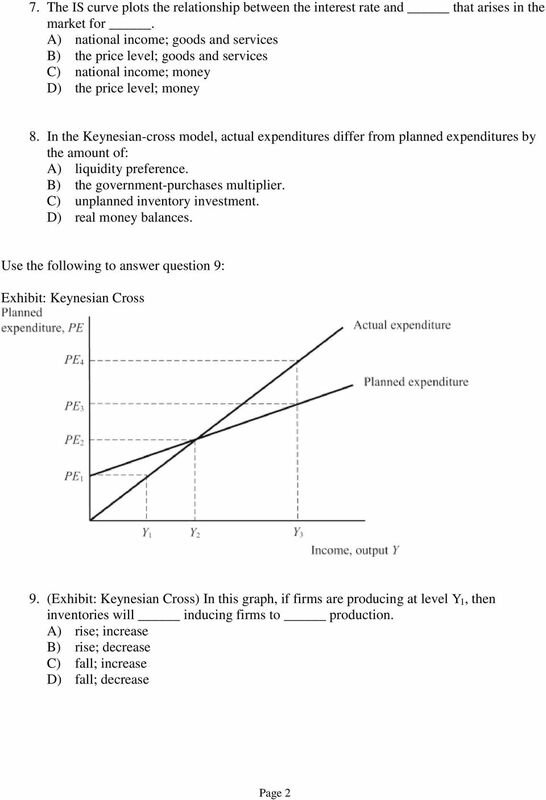 Macroeconomics, 6e (Abel et al.) Chapter 12 Unemployment and Inflation Unemployment and Inflation: Is There a Trade-off? 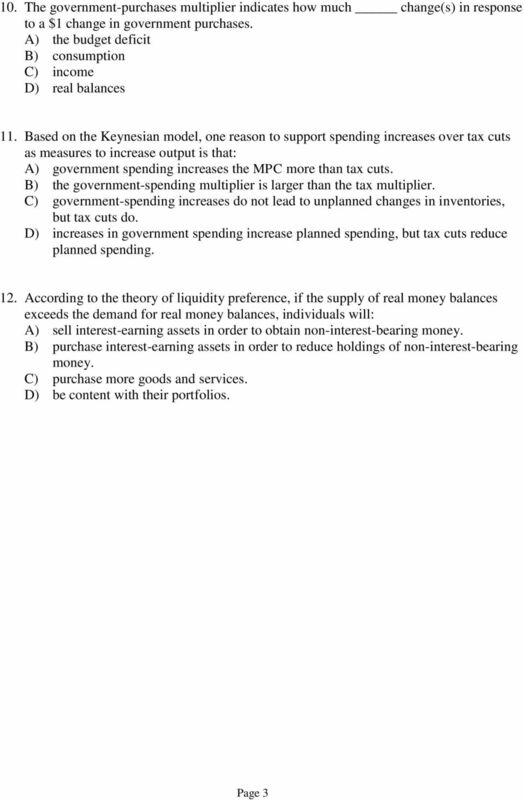 Macroeconomics, 6e (Abel et al.) Chapter 12 Unemployment and Inflation 12.1 Unemployment and Inflation: Is There a Trade-off? 2) Phillipsʹs research looked at British data on A) unemployment and inflation. 1 Econ 302 Intermediate Macroeconomics Chul-Woo Kwon Ch.5 Aggregate Supply and Demand I. Introduction We studied an economy when the goods and services markets are simultaneously in equilibrium given prices. b. Given this information, describe the government budget balance for this economy. Economics 102 Summer 2015 Answers to Homework #5 Due Wednesday, July 15, 2015 Directions: The homework will be collected in a box before the lecture. Please place your name on top of the homework (legibly). Econ 202 Final Exam. Douglas, Spring 2010 May 6, 2010 PLEDGE: I have neither given nor received unauthorized help on this exam. In this chapter we learn the potential causes of fluctuations in national income. We focus on demand shocks other than supply shocks. Chapter 8 Business Cycles Multiple Choice Questions 1. One of the first organizations to investigate the business cycle was (a) the Federal Reserve System. (b) the National Bureau of Economic Research. 2.If actual investment is greater than planned investment, inventories increase more than planned. TRUE. Macro final exam study guide True/False questions - Solutions Case, Fair, Oster Chapter 8 Aggregate Expenditure and Equilibrium Output 1.Firms react to unplanned inventory investment by reducing output.